A unique Zodiac settle designed by a leading figure of the 19th century Gothic Revival movement, William Burges. BEDFORD.- Cecil Higgins Art Gallery & Bedford Museum has purchased a unique piece of furniture created by one of the UKs most celebrated 19th Century makers. The rare item is a unique Zodiac settle designed by a leading figure of the 19th century Gothic Revival movement, William Burges. Designed for his own use, the Zodiac Settle (built around 1869) is an ornate canopied bench that combines the form of an Italian Renaissance day-bed with a castellated canopy. Subject to a temporary export bar as part of the work of the Reviewing Committee on the Export of Works of Art and Objects of Cultural Interest (RCEWA), this unique and experimental piece of furniture has been acquired thanks to a £480,000 grant from the National Heritage Memorial Fund (NHMF), £190,000 from the Trustees of the Cecil Higgins Art Gallery and £180,000 from the Art Fund. Previously owned by two prominent literary figures, Evelyn Waugh and John Betjeman, the settle will now form the centre piece of the Art Gallery & Museums new William Burges Gallery, due to open to the public late in 2012. The settle is made from painted, stencilled and gilded wood, decorated with rock crystal and slips of vellum. The central panel, painted by Burges collaborator Henry Stacey Marks, features the sun on a throne surrounded by the dancing signs of the zodiac. The Settles other panels show the planets as musicians and female figures. William Burges (1827  1881) was one of the most distinguished Victorian architects. His skills also extended beyond architecture, and he is particularly remembered for his painted furniture. The settle is an idiosyncratic example of Burges skill for reinterpreting medieval forms and decorations. The settle is also significant to the revival of interest in Victorian art and design in the 20th century. The fact that two prominent British literary figures John Betjeman and Evelyn Waugh, both owned the piece, suggest that the item was covetable at the time. Betjeman was left the remaining lease on Tower House, including some of the furniture, by ERB Graham in 1961, reflecting Betjemans fame as a public defender of 19th century architecture. 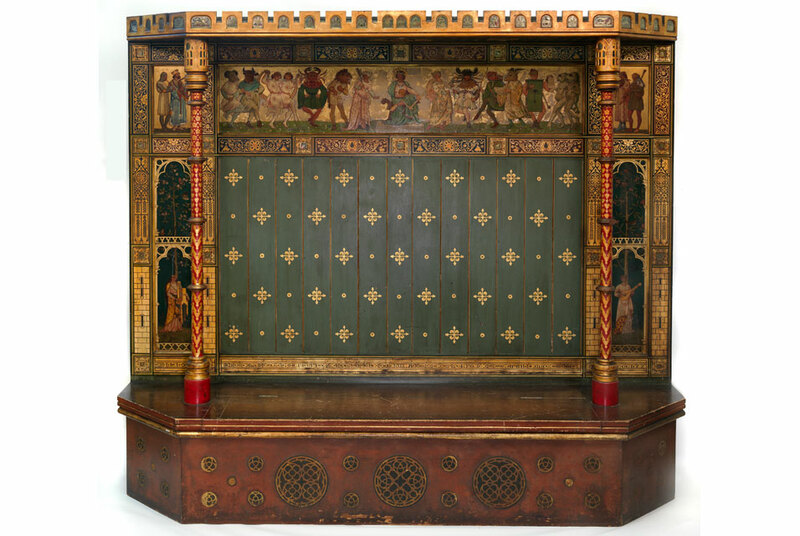 Betjeman gave three pieces of furniture to Evelyn Waugh: the Zodiac Settle, the Philosophy Cabinet (private collection) and the Narcissus Washstand (Cecil Higgins Art Gallery & Bedford Museum). Waugh writes in a letter to his daughter Maragret FitzHerbert in July 1965, of the Settle looking very well between the windows of the morning-room. Subsequently the Settle has passed through the Waugh family by descent. Cecil Higgins Art Gallery & Bedford Museum is the perfect home for this unique Settle. It currently houses the finest collection of painted furniture designed by Burges. These include the Sleeping Beauty Bed, the Narcissus Washstand and a dressing table, all from Burges own bedroom. In addition, the collection includes a pair of cabinet doors, a wardrobe, a zodiac-themed bookcase, a tulip vase, a decorative silver decanter, a set of knives and forks, an enamelled silver bracelet and a set of 30 zodiac-themed tiles. Burges always intended the settle for his own home. Firstly, his rooms on Buckingham Street off the Strand in London and later Tower House, the gothic residence Burges built for himself in Holland Park. Unlike other pieces of his painted furniture, the Settle was an experiment in form and the design was never repeated in any of his later furniture commissions. Looking at Music 3.0 Explores the Influence of Music on Contempory Art in NY and the Birth of "Remix Culture"